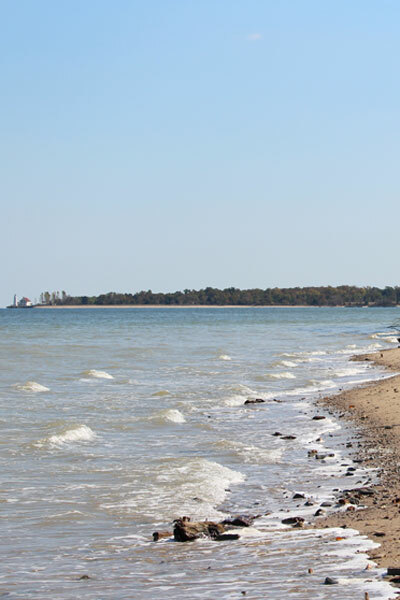 The Chesapeake Bay is home to a wide range of beaches where visitors can enjoy swimming, sunbathing, walking, boating, fishing, wildlife watching, photography, beachcombing, and other pastimes. Many beaches offer scenic views of historic sites, bridges, lighthouses, and other landmarks. At some locations, visitors may encounter driftwood, coins, sea shells, fossils, sea glass, historical artifacts, and other nautical treasures. Beach settings vary from crowded urban locations to remote, natural beaches. Some of the most secluded beaches of the Chesapeake Bay region are found on islands of the estuary and its tributaries. Public beach access is available at national parks, national wildlife refuges, state parks, county facilities, and other locations. One of the most extensive resources for locating public beach access in the estuary is the Chesapeake Bay, Susquehanna River and Tidal Tributaries Public Access Guide. Produced through a partnership between the State of Maryland, the Commonwealth of Virginia, the Commonwealth of Pennsylvania, and the District of Columbia, the guide provides information on hundreds of beaches, boat ramps, fishing areas, and other public access sites in the Chesapeake Bay watershed.